NEW BRITAIN - Before Jovan Rosa stepped up to the plate in the 12th inning Tuesday night he had a simple message for teammate Jamar Walton. The New Britain Bees third baseman stayed true to his word. Rosa hit a walkoff home run to cap off the Bees’ 6-5 comeback win against the Road Warriors at New Britain Stadium. He was 0-for-5 for the game heading to the plate. In a way, Rosa’s night mirrored that of his team. Held in check by Road Warriors starting pitcher Felix Baez, New Britain scored four runs from the eighth inning on, including a two-run homer from Deibinson Romero to tie the game at 5-5 in the ninth inning. In six innings of work, Baez gave up two runs on five hits, five walks and struck out three. Romero was the leader of the offense, going 3-for-5 with three RBI. Jamar Walton added three hits of his own, including two triples. 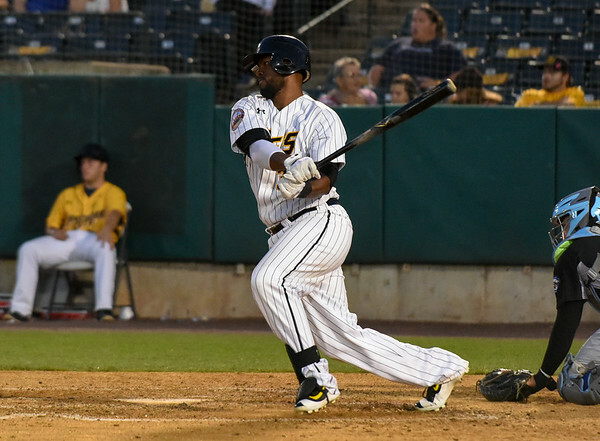 Darren Ford had two hits for the Bees, including a leadoff single in the first inning that ended an 0-for-14 slump. On the mound for New Britain, Kyle Simon had an up-and-down start. In six innings, Simon gave up four runs on 10 hits and didn’t collect a single strikeout. New Britain has now taken the first two games of the four-game set. If the Bees win either of the final two matchups, it will be the team’s second straight series win. New Britain hasn’t won consecutive series since the end of July. With the Somerset Patriots losing and the Long Island Ducks getting rained out, the Bees move to within one game and 3 ½ games behind, respectively, the top two teams in the Liberty Division with 24 games left in the regular season. Posted in New Britain Herald, New Britain Bees on Tuesday, 21 August 2018 23:30. Updated: Wednesday, 22 August 2018 05:58.